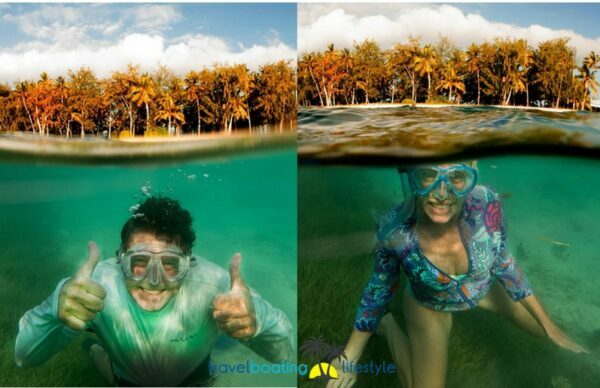 It’s an exciting time at Travel Boating Lifestyle as we join a global social media campaign! Like Alice’s Adventures in Wonderland, it’s easy to get lost down the rabbit hole of creativity when workdays are spent in front of screens (a no-brainer when working on a social media campaign). While the sea sparkles beneath a sun-blessed sky manta rays glide beneath our keel. Sea birds soar overhead while we brainstorm, creating and editing stories, photos and videos. Meanwhile palm trees are caressed by trade winds, their whoosh a soothing soundtrack to the ocean lapping at our hull. Beaches are kissed by a turquoise sea in a beguiling scene that beckons us outdoors. We’ll shut our screens mid-project to jump in the water for a swim or a snorkel, a scuba dive even. Or we might delve into the toy garage and launch the paddle boards, kayak or kite board. The weather Gods don’t always play nice but when they do we like to play too! Which is actually the point of being boat-bound digital nomads. 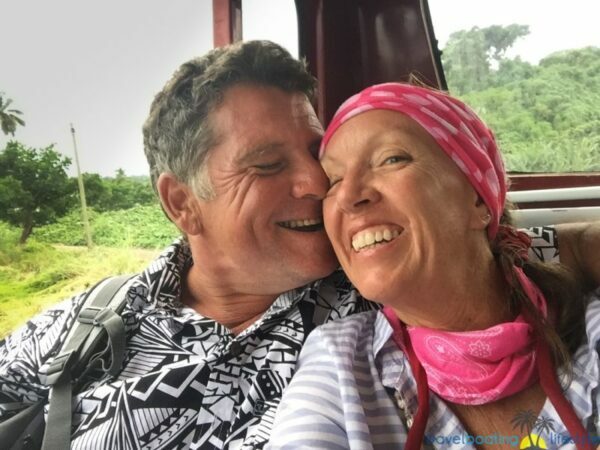 As a travel writer/photographer guided by wanderlust, we (Fiona Harper travel writer) are fortunate to be able work wherever our travels take us. Which today happens to be northern Fiji, but it could just as easily be outback Australia. This ability to be creative while traveling is precisely why global corporation DOMETIC wanted TBL onboard as a featured Mobile Living Traveler. We are SUPER EXCITED to team up with DOMETIC to feature in a world-wide year-long social media campaign. Dometic chose ten travelers around the globe to feature in a digital influencer initiative known as Mobile Living Stories. Images, videos and stories produced by the ten travelers will be promoted to DOMETIC’S 150,000 social media followers and world-wide customer base during the year-long campaign. 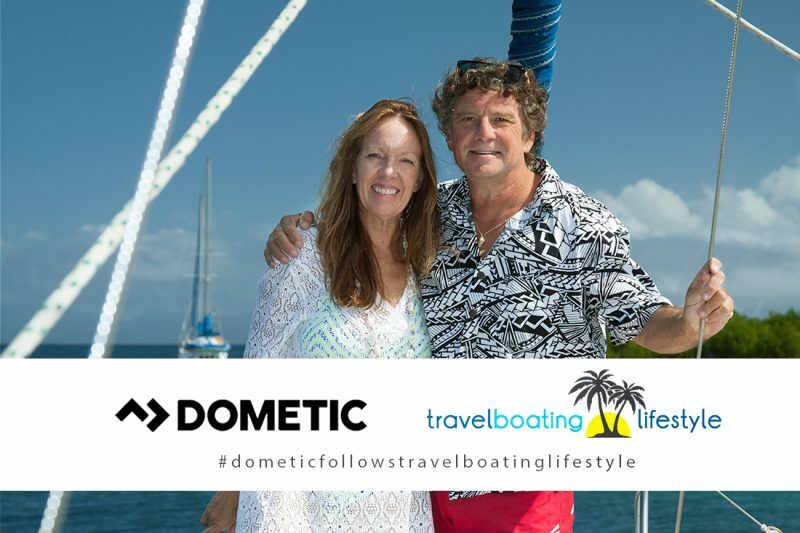 TRAVEL BOATING LIFESTYLE feature as DOMETIC’S inaugural travelers living a mobile lifestyle afloat as well as on the road through travels in the South Pacific and Australia. 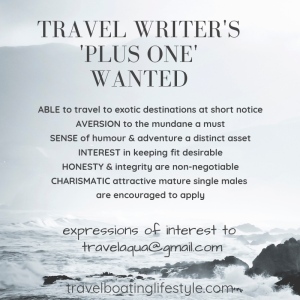 We have been focused on creating fabulous content for TRAVEL BOATING LIFESTYLE, producing videos, photos and stories that showcase life as mobile travellers. Truth be told, we’ve spent way too many days down that creative rabbit hole, when what I really wanted to do was unfurl the hammock and curl up with a book, a slice of banana bread and a gin and tonic at hand. As storytellers blessed with living a nomadic life influenced by creativity, TRAVEL BOATING LIFESTYLE is passionate about tracking down interesting stories and capturing photos and videos from our travels. We’re excited to share our adventures with a global audience of enthusiastic travellers, and hope that our stories encourage curiosity about our planet, ultimately enticing others to travel. It’s a real thrill to work with a market leader like Dometic, who ‘get’ what mobile travellers need. We’ll be road testing products that eliminate many of the challenges of a mobile lifestyle, allowing us to get off-road and offshore while enjoying modern conveniences. As the epitome of the anti-Domestic Goddess, who would have thought the prospect of a washing machine, macerating toilet and reliable refrigeration would bring such unrestrained joy! Sharing our Mobile Living Stories with DOMETIC is a no-brainer that fits happily with TRAVEL BOATING LIFESTYLE’S ethos. DOMETIC is a global company that makes mobile living easy by providing solutions to satisfy the essential needs for those travelling by boat, motorhome, car or truck based on outstanding design. With headquarters in Solna, Sweden, DOMETIC products are sold in approximately 100 countries, operates 22 manufacturing plants in nine countries, employs 6,500 people and had net sales in 2016 of SEK12.4 billion (approx. AUD1.9 billion). We’re proud to join their global tribe and continue our Wonderland-type adventures. NOTE: Travel Boating Lifestyle has no continued association with David Hartman photographer. Enjoyed your article immensely and having used Dometic appliances in the Australian outback can recommend their efficiency and reliability in various weather situations. Well done you two. CH.